This is a very welcome disc that presents for the first time the complete songs of a composer better known for his orchestral music. Northern Flowers are also recording Glazunov�s piano compositions, the string quartets and an anthology of the organ music. This is all being done in cooperation with the Glazunov Foundation (www.glasunow.org) who are based in Munich. Glazunov's songs and romances date from between 1881 and 1916. Most are from the fertile two decades before 1900; well before the flight from the 1917 Revolution. They are variously for soprano, mezzo and baritone. The poems are either originally in Russian or set in Russian translation in the case of the four Heine poems from the early 1880s (trs. 21, 23, 25, 27). Glazunov's choice of poet was unerring. There's a lot of Pushkin, some in oriental vein, Petrarch, Lermontov (he of Tamara fame), Heine as well as lesser known names: Maikov, Seversky, Kremlev, Korinfsky, Nekrasov and traditional. The composer clearly had serious intentions for these songs which delve into the deeper realms: passion, loss, even pictorial opportunities are handled with enchantment such as in the Oriental Romanza - the first of the two Pushkin songs Op. 27. The Six Songs Op. 59 date from the time of the Sixth Symphony and the influence of Tchaikovsky's Romances and of the opera Eugene Onegin ring assertively without spoiling the experience in any way. If you want to love (the fourth of Op. 59) carries, in Yuri Serov's accompaniment, both moonlight and the power of great rivers. Later, in the Heine setting in Russian translation by Nekrasov, Lukonin conjures the turmoil and claustrophobia inherent in Stifling (tr. 21). After the Iberian sultriness of The Grace Cup (tr. 11) I had expected a more obviously nationalist flavour in Spanish Romanza but despite its charming rise and fall the accent is enigmatically Scottish if anything. On the other hand Glazunov does not disappoint with the fresh and grumblingly vivacious Spanish Song (tr. 29). In the preceding Song from Op. 4 we are also served Arabian atmosphere with a generous cake slice. All very attractive even if working to a style template. Mikhail Lukonin's supercharged yet sensitive baritone is from the best Russian tradition with a ringing Atlantov-style top array. You are left in no doubt of his wondrous qualities by The Belle (tr. 2). He falters however in the cruelly demanding high pianissimo at the end of The Sky's All Silver (tr. 10). Lyudmila Shkirtil has a substantial and strong voice with an emphasis on the thicker diaphragmatic textures. Her top range trounces all comers as we can hear at the end of The Song op. 27 No. 2. 1898 must have been a good year for songs because he followed the Op. 59 set with another six, this time for soprano here taken by Victoria Evtodieva. The Grace Cup has more than a touch of Carmen about it. The Nereid paints and trills the watery spell of this river nymph. Not all these songs match the quality of the Op. 59 set. In A Free Song Evotdieva and Shkirtil tackle the duo with sweet melismatic concord. It�s a lilting setting which catches the image of long summer evenings and verandas. Do not on any account miss Evtodieva's superbly controlled and steadfast 'Mashenka's eyes are full of tears' from the traditional Russian song Masha is told not to cross the river. Also notbale is the undeniably misty passion in Evtodieva's Whenever I hear your voice (Lermontov). Throughout the piano sounds baritonal, softened, sometimes boxy. The emphasis may be down to the church acoustic but one soon adjusts especially in the face of such imaginative playing as for example in the bardic trills of The Nightingale (tr. 26). The track allocation and identification of singers is inaccurate. It is listed accurately in the headnote above. Yuri Serov provides the detailed notes. The texts are in Russian and English side by side but the Russian is only in Cyrillic. It would have been even better if a Russian transliteration could have been given alongside the Cyrillic. As it is though, the booklet is extremely well done and has plenty to inform and provoke the listener. I think it's a pity that two songs have been excluded. No matter how derivative they may be we would have been able to have the truly complete picture if only purism had not raised its unwelcome head. If you have any thought for the Russian romance and perhaps enjoy the songs by Tchaikovsky or Medtner or Rachmaninov then be sure to get this disc. Glazunov will, I think, surprise you. You might have expected salon tawdry. 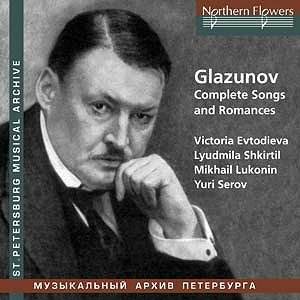 On the contrary, while Glazunov might have had little time for the human voice he delivers here a generous selection of songs where he aims for the very best and in many cases proves that it is within his grasp.